The Next Transformers Game Crosses Continuity Lines. I'm Scared. Transformers: Rise of the Dark Spark is not just a sequel to Activision's lovely War for/Fall of Cybertron games or a Michael Bay-flavored movie tie-in. It's both, and that scares the spark out of me. Making a good Transformers video game is hard, at least I assume this is the case, because the majority of attempts over the past decade have been pretty abysmal. Let's break them down. That's not counting portable editions (generally horrible) or mobile games (there was that one okay one). 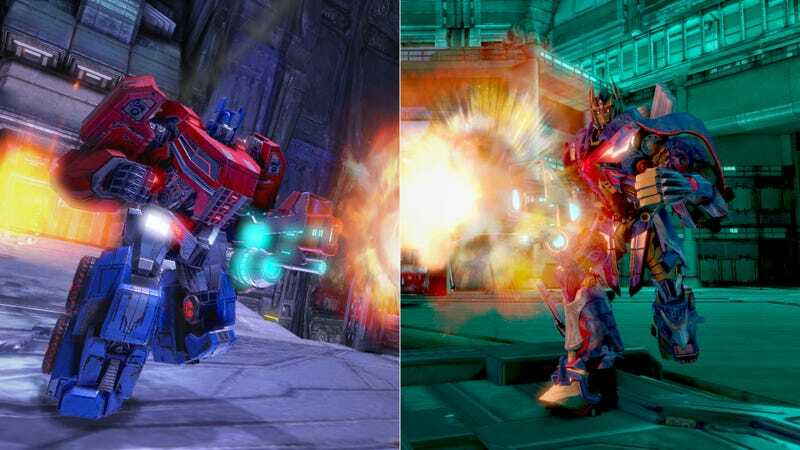 The industry's track record with Transformers video games is not good. Looking at this list, Transformers: Rise of the Dark Spark (we're not even trying with the subtitles anymore) has one thing going for it — it features characters and settings from High Moon Studios' recent success stories. That's one good thing. One good thing that is quickly negated by the fact that High Moon Studios isn't developing this game. Even if it was, the studio still managed to make a mess of the Dark of the Moon tie-in from 2011, and half of this game is movie-based. No matter now, as Austin-based Edge of Reality is handling development for the Xbox 360, Xbox One, PS3, PS4, PC and Wii U versions of Rise of the Dark Spark. Looking over the studio's pedigree, they've done some ports of Tony Hawk Pro Skater for the Nintendo 64, Shark Tale and Over the Hedge movie games, more ports — oh, they worked on the PlayStation 3 version of Mass Effect. Earlier this month the studio released a free-to-play shooter called Loadout on Steam. They've done some fine work, but there's not enough there to ease my worries. I really should be excited about two Transformers universes colliding — I suppose in a way I am. I've not much love for the Michael Bay-verse, but I am incredibly interested to see how Edge of Reality ties the two together — what will High Moon's G1-flavored bots think of Bay's insectoid aliens machines? It's a situation bursting with narrative possibilities. It's got the compelling progression-based multiplayer of the Cybertron games, including the amazing Escalation horde mode. And hey, it looks like Edge of Reality knows how to develop for PC, unlike some studios (High Moon) I could name. And who knows? If Transformers: Verb of the Adjective Noun takes off, it could lead to more universe-hopping. Let's get some Beast Wars up in this business. The one glimmer of hope in this new game announcement comes from the 3DS side of the fence. Activision tells me the version of the game for Nintendo's handheld will be a tactical role-playing game developed by WayForward Technologies, the modern masters of 2D gaming. There are so many words in that last sentence that make me happy. Almost enough to soothe my troubled heart. Almost. I am still worried about Transformers: Rise of the Dark Spark. At least I am not alone. We've finally found common ground, frowny-face Optimus.